Hey dears! Guess what? APPETITE Magazine will be celebrating its anniversary this October. 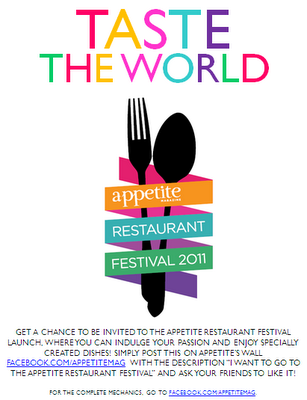 In line with this, they will be holding a yearly event, Appetite Restaurant Festival, which will be launched at the Shangri-la Plaza Mall on October 13, 2011. Get a chance to be invited to the Appetite Restaurant Festival Launch, where you can indulge your passion and enjoy specially created dishes. 1. Go to APPETITE MAG and LIKE their Facebook Fanpage. 2. Download the PHOTO above and UPLOAD and POST it on their wall. 3. Then include this description - "I want to go to the Appetite Restaurant Festival." 4. Then convince all your friends and as many people as you can to LIKE the photo! The top 3 photos with the most number of likes by October 12, 5 pm will be awarded 2 exclusive access/invites each to the Appetite Restaurant Festival Launch on October 13. In case where there is a tie, the participant who first accumulates points based on the time stamp of likes will be declared the winner. So what are you waiting for dear coffeeholics? Spread the word and get those exclusive invites! I hear that there are special dishes will be created just for the event. Just talking about this is whetting my appetite. Now if only I weren't on a diet and going to Boracay on the 15th of October. So just in case you WIN and get IN - don't forget to share to me your experience ha!